As a feminist culture, at Twin Oaks we tend to disregard traditional gender roles and behavior. Women and men choose their roles in the community based on their interests, strengths, and passions, not on anyone else's preconceived notions. Women and men operate chainsaws and drive tractors, and men and women cook and care for children. We all wear clothing we find comfortable--pants for working in, skirts for coolness or festivity, heedless of mainstream ideas of "acceptable" fashion choices. Our commitment to fostering a supportive and joyful environment for all people—women, men, lesbians, gays, and children--is an integral part of Twin Oaks Community. We organize and host a yearly Women's Gathering to celebrate our creativity, culture, and diversity in a women-only space. We have also hosted gatherings for QIC (Queer in Community). "We have made an agreement that there will be no live TV here, so I'm not being confronted on a day to day basis with unrealistic images and ideals of how a woman should look and act, nor constantly reminded that there are standards, which I had no part in creating, that I am not meeting. Therefore, what I do see on a day-to-day basis is a variety of women feeling free to express their true identities, talents, and unique beauty, which in turn helps me connect with my own. And while we do show movies every weekend, I find I am less interested in what Hollywood has to say about life, and more interested in what I have to say about it. I not only found my voice here, but the confidence to use it." "I've worked on our vehicles for the full 9 years I've been here—I started on my first day! (I was a mechanic for 15 years before joining Twin Oaks.) The job is satisfying yet frustrating, and never boring—there's always new challenges and new technology. It's a good feeling to be able to do this work in a male-dominated field. 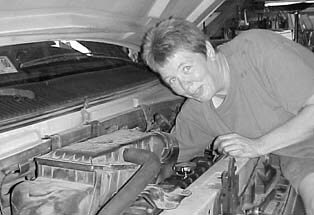 Our local auto-parts store is respectful, and I like giving the message that women can do this work." "I've lived at Twin Oaks for 10 years. Upon arrival from a big city, I was struck by how safe it feels here to walk alone in the dark. It's an incredible feeling of freedom to walk anywhere on our land without fear. There's also an absence of sexism, which I find refreshing. I learned how to do construction work and discovered the joy of power tools. Women are encouraged to do whatever work they want. Also I've enjoyed membership in various women's groups over the years, and have found many dear friends here, both male and female. The hugest difference, however, was being supported during my two pregnancies and homebirths." 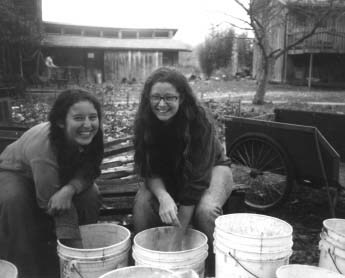 The Feminist EcoVillage Project is a group of ecovillages which hold feminism as a core value and are interested in members who consider both sustainability and feminism as central to their lives. 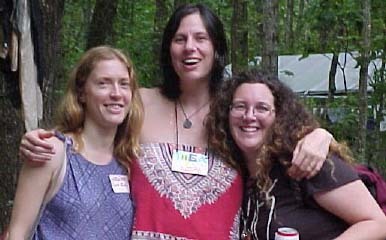 Living in a feminist ecovillage is a way of addressing gender and power imbalances that exist in the world, while living out our ecological values. We are free to create new cultural norms, ones that celebrate women and men as whole humans beings who are living in an interactive relationship with the earth. What might this culture look like? We are interested in opening up work/play/relationship areas for women and men that were once off-limits due to mainstream values. We want to include the needs of the earth in decision- making, and consider the wholistic health of both the earth and it's inhabitants at the same time. Please visit [website temporarily removed] for more information. Twin Oaks is actively seeking new members who want to join us in strengthening and maintaining the diverse, accepting culture we have worked hard to create. If you are reading this you may want to consider living at or visiting Twin Oaks. We have regular Saturday tours, as well as 3 week visitor periods for people who want to spend more time here or who are interested in applying for membership. If you have any questions, please contact us at the following address.